This 100mm Sintering Turbo Wheel is used for grinding, leveling and polishing stones, such as granite, marble, and artificial stones etc. The turbo cup wheel is for fast rough dry or water-coolling grinding and sharping of marble and granite surface, edges and angels. Turbo Cup Wheel with high quality is definitely your best choice. Our main product ranges include Diamond Saw Blade and cup wheel, Diamond Wire and Core Drill. 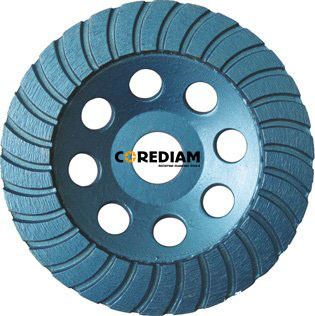 Looking for ideal 100mm Turbo Wheel for Granite Grinding Manufacturer & supplier ? We have a wide selection at great prices to help you get creative. All the 100mm Turbo Wheel for Stone Grinding are quality guaranteed. We are China Origin Factory of 100mm Turbo Wheel for Marble Grinding. If you have any question, please feel free to contact us.